It's easy to drive a car. Turn the key, slip it into gear and press on the accelerator. The many sensors located throughout modern vehicle make it unnecessary to stress about your car's health. When your tire pressure is low a tire icon appears on your dash. When I'm running low on fuel my car lets me know. What if you could get messages when your Heart is in need of attention? Our lives are sustained by the heart's continuous pumping of blood. This small muscle does an amazing job and deserves our support! The Heart is designed to contract and fling blood into the Aorta, the body's largest blood vessel. The Heart and the Aorta have an intimate relationship. The Heart muscle spirals with each contraction and a jet of blood spins into the Aorta. The Heart and the Aorta engage in a subtle and beautiful dance with very precise rhythm and timing. With each heart beat a pressure wave, the Primary Wave, spreads out from the Heart and ripples along the walls of the entire arterial tree. The Primary Wave travels about 10 times faster than the flow of blood itself. The Aorta is smooth and without branches until the blood vessels feeding the intestines and the kidneys branch off in the abdomen. Reflections of the Primary Wave occur at these branching points and from the point where the Aorta divides in the pelvis. The Aortic reflections sum together and form a Reflected Wave that heads back towards the heart. The Reflected Wave is very important to heart health. In a healthy young person the Reflected Wave returns to the heart just as the heart completes its contraction. The Primary Wave is almost spent at this time. The Reflected Wave rolls in just as the Primary Wave ends. The Reflected Wave keeps pressure in the Aorta high enough for blood to flow into the Coronary Arteries feeding the heart muscle. Without the Reflected Wave the heart muscle would not get much blood flow. Humans are designed to live for about 30 years. That is the average age at death for most of human history over the last few hundred thousand years. After about 30 years of age our Aortas start to stiffen and this affects speed with which the Primary and Reflected Waves travel. With increasing Aortic Stiffness there is faster wave travel. In an older individual the Reflected Wave returns to the Heart early and meets the Primary Wave just as two ocean wave meet, joining together to form a larger wave. The Reflected Wave's pressure increases and this has very serious consequences for heart health. With increased Reflected Wave pressure there are three ominous consequences. 1) To push blood into the Aorta, against the force of the returning wave, the heart has to work harder. This leads to higher blood pressure (Hypertension) and a greater work load for the heart, weakening the heart muscle over time, leading to heart failure 2) During the heart's relaxation phase there is less pressure driving blood from the Aorta into the Coronary Arteries, resulting in less blood flow to the heart muscle 3) Peak blood pressure is quite elevated, damaging fragile blood vessels in the brain, kidneys and other organs. Over time this contributes to Dementia, Kidney Failure and other illness. Aortic Stiffness is a measure of stiffness along the axis of the spinal column (affecting Internal Organ circulation, function and overall health) and has been shown in many scientific articles to predict risk of death from all causes. 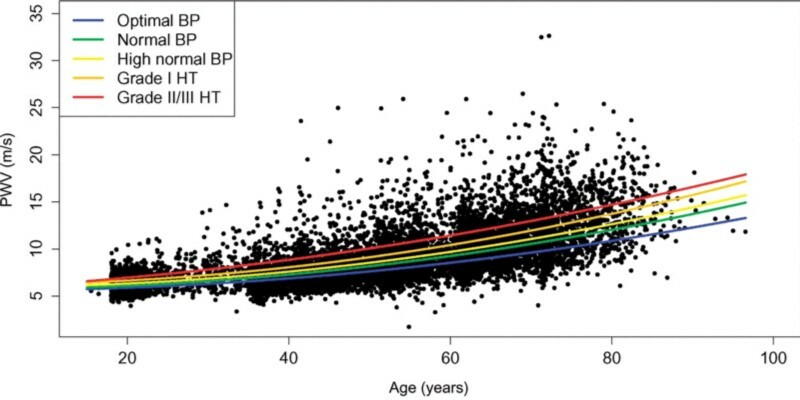 Aortic Stiffness (measured using Pulse Wave Velocity) increases slowly with aging as shown in the graph below. It can also be seen that there is a large variation in Aortic Stiffness at any given age. Determinants of pulse wave velocity in healthy people and in the presence of cardiovascular risk factors: 'establishing normal and reference values'. Aortic Stiffness is related to three factors: 1) Genetics 2) Childhood dietary, activity and stress management habits 3) Adult dietary, exercise and stress management. Adults with increased levels of Aortic Stiffness can reduce their Aortic Stiffness, increasing wellness and lifespan, by exercising regularly, supplementing with Omega-3, Garlic, Vit D (shown in the scientific literature to be effective) and learning how to better manage stress. Yoga and Tai Chi have for centuries taught that stretching along the spinal axis, leading to reduces Aortic Stiffness, is important for a long and healthy life. Modern science, through measurement of Aortic Stiffness, has shown the accuracy of this ancient wisdom. Measurement of Aortic Stiffness has previously required expensive (> $10K) and complicated research instruments. iHeart Internal Age is an affordable (< $200) and easy to use Aortic Stiffness measurement system. iHeart uses a fingertip arterial pulse sensor, an iPhone or iPad and a 30 second test to determine Aortic Stiffness. Within a few weeks of making changes to habits of exercise, diet and/or stress management iHeart will objectively show improvement and motivate you to maintain your healthy lifestyle choices. iHeart can be part of your life vessel's health dashboard, indicating when you need to need to 'pull over' for some maintenance!